Truthfully, I had never been to Ramen Nagi and I was a bit intimidated about eating in Golden Gai but it turned out to be a good experience. 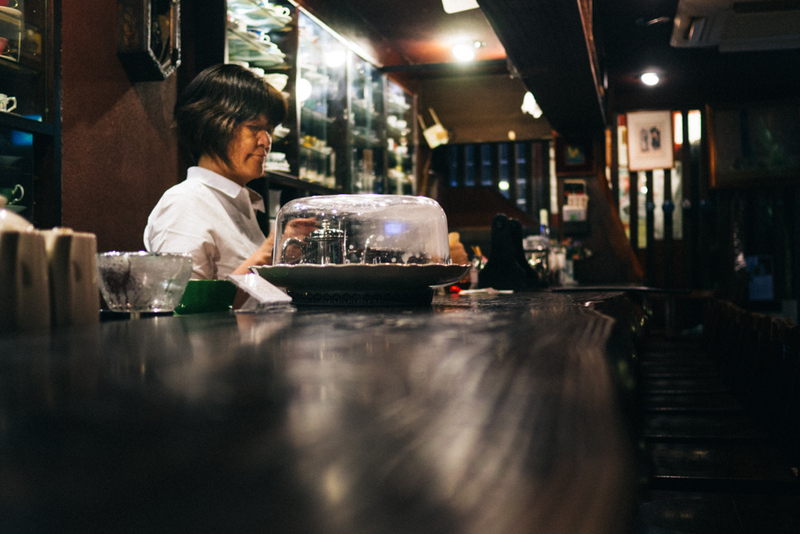 Like many places in Golden Gai, it looked a little sketchy from outside with a hand-scrawled sign in English over the door (and misspelled at that) and a very steep and narrow stairway up to the restaurant. To be fair, if you can read Japanese, it does say Ramen Nagi, open 24 hours on the sign next to the door. Once inside, you are seated at a narrow counter with about 12 seats. True to ramen culture, your goal is to eat your ramen as quickly as possible and get out to make room for the people queuing up behind you. Fortunately, I went very early so there were not many people waiting to be seated and I was able to take a few photos. To be clear, Ramen Nagi is about the fish. The broth is famously made from dried baby sardines and the flavor is, well, sardine-y. If you don’t like sardines, you’ve come to the wrong place. Even the vinegar used to season your ramen is sardine-infused. But Ramen Nagi has the mysterious Japanese umami flavor in abundance, and the soup never seems overpowered by fishiness, but rather a nice balance of the smoky, salty broth combined with the fish and nori sheets. The ramen itself is very thick and wavy, a technique used by ramen chefs who want you to really experience the flavor of the broth in every bite. Broth clings to wavy noodles and the thickness absorbs some of the liquid. Given that Ramen Nagi is open 24 hours, it would be a great choice for those who miss the last train, voluntarily or involuntarily, and want a bowl of something delicious to see them through to daybreak. As for me, it broke through my irrational fear of eating in Golden Gai and added another notch on my “best ramen in Tokyo” belt. 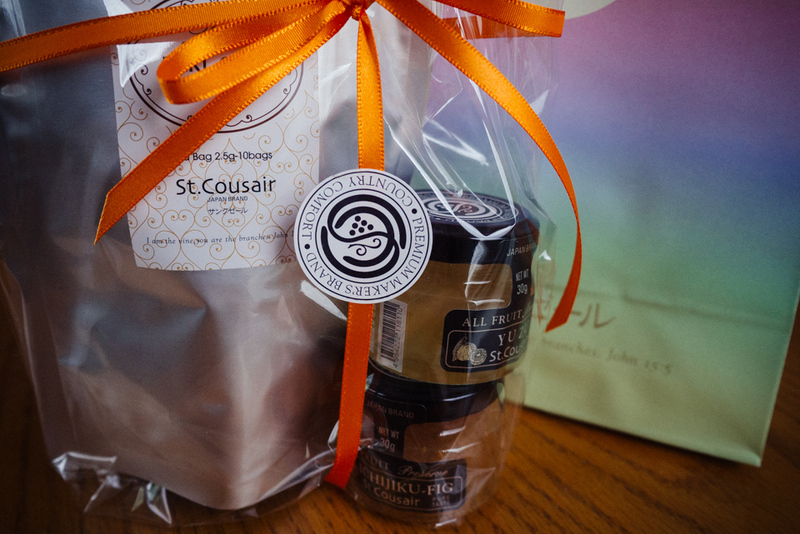 As I browsed through other products made by St. Cousair, I noticed the verse appeared on every label. After purchasing some Earl Grey tea and some little jars of ゆずyuzu marmalade (made from a citrus that tastes like a cross between orange and lemon) and いちじくichijiku fig jam, I hurried home to check out the company online. Sure enough, on the English page of their website, Mrs. Kuze speaks plainly about the faith of her and her husband and how committing to run their struggling company by Biblical principles turned everything around for them. With business booming and distribution all over Japan, the Kuze’s decided to build a church on the site of their winery. Unlike many “churches” in Japan which are merely beautiful buildings for young Japanese people to hold a wedding, theirs is a real church with services every Sunday. Mrs. Kuze is a seminary graduate and pastors the church there. Since its completion in 2005, over 100 people have been baptized there, a phenomenal number for a rural Japanese church. In a nation where less than 1% of the population professes a Christian faith, it is rare to find a company that presents Christianity so plainly to its customers. Yes, there have been several prominent Christian companies in Japan (Morinaga, the huge confectionery and dairy company was founded by Christian Taichiro Morinaga, grandfather of Akie Abe, first lady of Japan), but few that are so direct about their faith. One could call St. Cousair the “In-n-Out of Japan” and not be far off. In any case, I am proud to be able to give such a precious gift to a friend back in California. While the gift is but a token, the story behind it is inspiring. It’s an honor to be able to support a company with a vision to share the gospel like St. Cousair. Visit the St. Cousair webpage in English or in Japanese. 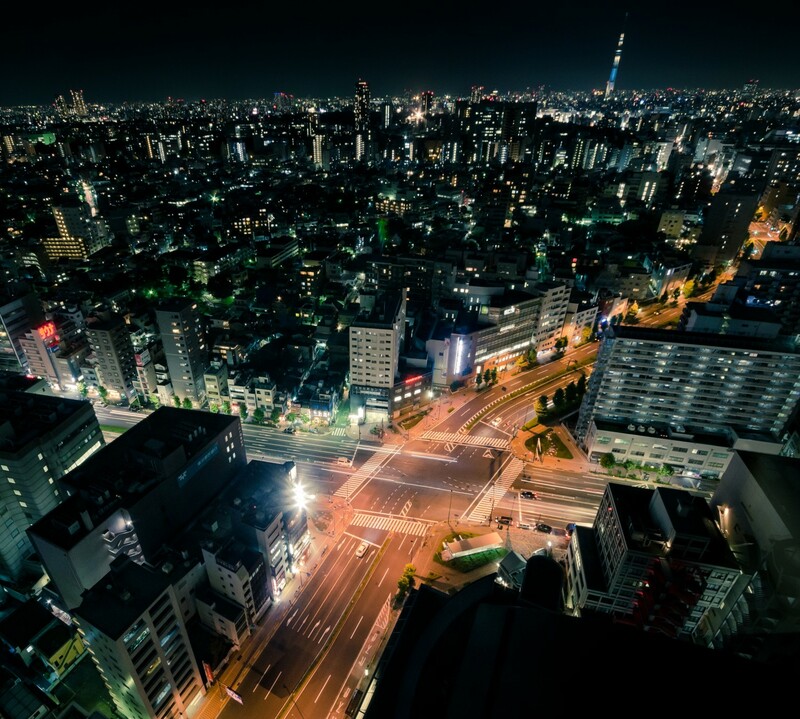 In the 1980’s, when the economy of Japan roared like a lion, Americans returning from Japan would shock their friends by telling them that a cup of coffee in Tokyo costs ten dollars. Ironically, it was probably the introduction of Starbucks into Tokyo in the late-1990’s that eventually drove the cost of a decent cup of coffee down below five dollars. Today, with a Starbucks in every neighborhood, Japanese cafes like Tully’s and Doutor at every train station, and gourmet coffee sold even at local combini, cheap coffee is literally a few paces from anywhere you might be. So imagine my surprise when I sat down at the rustic wooden counter at Bon in Shinjuku, opened the menu and found a ten dollar cup of coffee on the menu. To be more accurate, 1,080 yen, not quite ten dollars at today’s exchange rate, but a couple years ago, closer to twelve dollars. 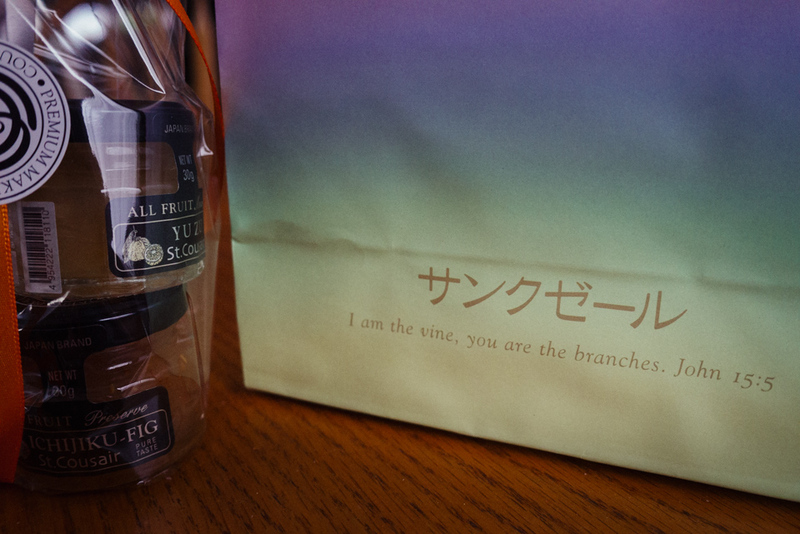 And not just one cup of coffee, but a half dozen different cups of coffee ranging from 1,080 to 1,400 yen. There was even something called “Coffee Service” on the menu that was priced well over thirty dollars. On any other day, I would have given the barista an embarrassed smile and quickly excused myself to the nearest Mister Donut, where I could get coffee and a half a dozen donuts for that price. But I had purposely sought out Bon, intrigued by a short article I found in a coffee mook (a “mook” in Japan is a magazine-book). The current crop of Tokyo cafes are hipster-minimalist with unfinished wood tables and exposed pipe in the ceilings. Bon looked like a cafe right out of the 1960’s; from the photos it was almost like you could smell the smoky aroma of cigarettes seeping out of the aged oak counter and shelves. I had to experience it for myself. In my younger days I played a Nintendo game called “Animal Crossing” where you play a human character living in a town where all your neighbors are animals. In the basement of the museum of your town was The Roost, a dark little cafe run by a pigeon named Brewster. The more you frequent The Roost, the more you realize what a terrific barisa Brewster is. This is sort of how I imagined Bon. After all, I was standing on the sidewalk outside the cafe for several minutes before I recognized the kanji on the sign and decended the steep dark stairs into the shop. I ordered the Brazilian coffee from the several different ten dollar types on the menu and watched as the barista ground the beans and made an expert pour-over with the little volcano of grounds forming in the middle of the filter. Minutes later, a small pot of coffee (which was closer to 1.5 cups) was set in front of me along with one of the hundreds of unique cups Bon has on its shelves (which I would later learn was more than 1500). A tray with a bowl of coarse sugar and chilled cream was also provided. I would like to be able to say that Bon’s ten dollar coffee was the best I’ve ever had. In truth, it was merely good, better than the overrated Blue Bottle in San Francisco but not as good as little Ekoda Coffee down the street from our church. However, I will say it was the best ten dollar cup of coffee I’ve ever had. And hopefully, the only one. It’s raining today, and being cooped up inside means finding something interesting to do. I remembered a little treat I had in the okashi (snack) cupboard that I had passed many times in the aisles of pretty much every supermarket we shop at, only last time, I picked up a bag. Japan is famous for a lot of things, but one thing we seem to get the most questions about are the exotic types of Kit Kat flavors that are available here. There is even a gourmet shop in the basement of a department store in nearby Ikebukuro that sells the rarest of flavors at premium prices (think in the neighborhood of $4 per American sized Kit Kat bar). Kit Kat for common folk used to mainly include only dark chocolate, the ubiquitous matcha (green tea) and more frequently, strawberry. But as of several months ago, a new flavor began showing up regularly: cheesecake. And this was no ordinary cheesecake flavor; the picture on the bag showed a bar after it had been toasted in the oven for a few minutes. Generally speaking, when it comes to snack food, I’m not one to add any extra steps between the process of getting it from the bag to my mouth. Perhaps that’s why I waited months before actually picking up a bag to try it. When a chat with my friend led to more Kit Kat talk, I remembered my secret stash and decided to give it a try. 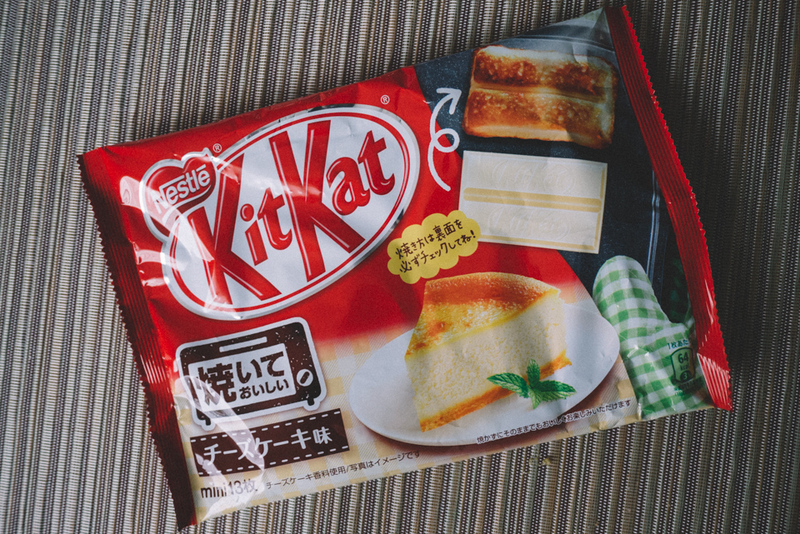 So here is my report of the “unwrapping” of the Baked Cheesecake Kit Kat. The instructions on the wrapper, from what I can make out with my terrible language skills, basically tell you to please use a saucer or tray to toast your Kit Kat in the oven. If you fail to use a saucer or tray and your Kit Kat catches fire and burns your house down, don’t say you weren’t warned. 13 times. Being an American, I completely ignored the instructions and used a piece of foil instead. I popped the Kit Kat into the oven, turned it on and a few minutes later, voila! 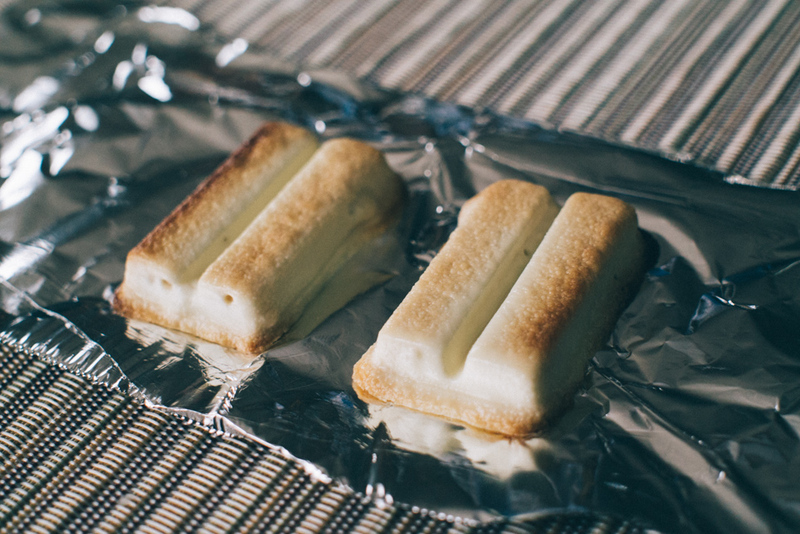 Out come the perfectly toasted bars of sweet goodness. So I know what you really want to know is how they taste. Well, I was skeptical that the the taste of any candy bar could be improved by a few minutes in the toaster oven. And I was completely wrong. It’s hard to completely describe but the flavor reminds me of the top layer of a creme brulee, but with the melty wonder of white chocolate with a hint of cheesecake flavor. It is heaven and I am hooked. 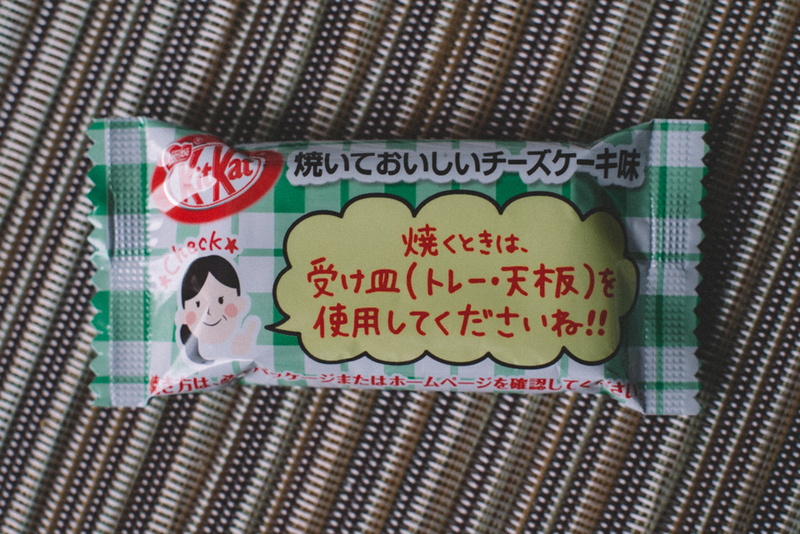 So if you’re not a fan of more traditional Japanese Kit Kat flavors like sakura (cherry) or wasabi (green horseradish), you’ll probably want to give this amazing flavor a try. If I don’t buy them all first. This past weekend, I had the most amazing dessert. A cake, made from high quality matcha (green tea) powder, so delicate and light, without the lingering sugary taste of most American desserts. But what intrigued me most was the label on the box it came in, proudly claiming the company has existed since 1753. 1753. 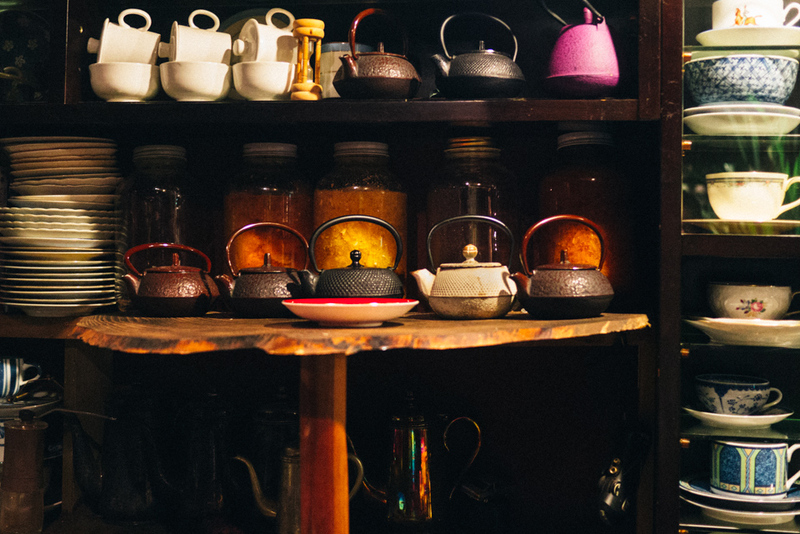 23 years before the United States was even the United States, this company was making tea. And 261 years later, they were still making tea and exquisite desserts containing tea. This is one of the amazing things about Japan to me. 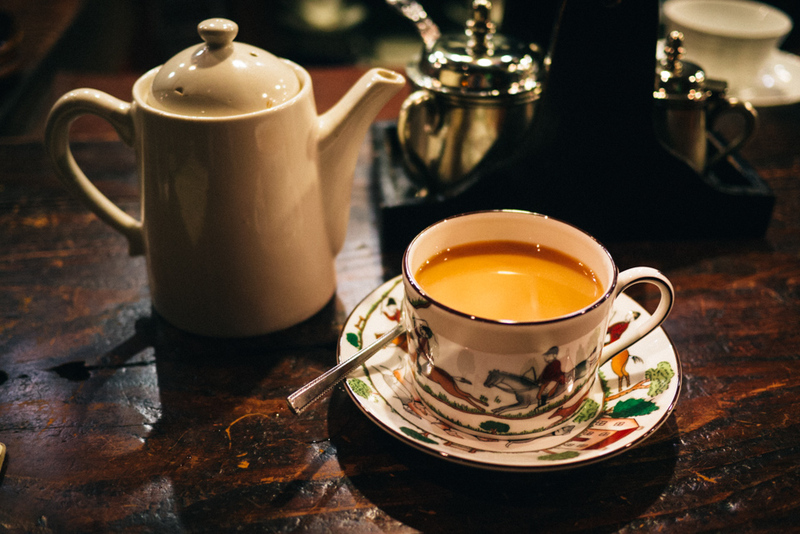 Shops that make simple things like tea, chopsticks, or handmade paper continue to exist after hundreds of years in the same line of business. One can understand that a company that is able to survive for so long has been able to do something right, and if it involves making the same product the entire time, they are drawing from decades or centuries of previous knowledge to improve upon what they know. Craftsmanship is real in Japan, and it makes its way into the simplest of things, even a slice of cake. Sushi in America in expensive, but in Japan, sushi can be one of the cheapest meals you can eat out. Especially if you go to Kaiten Sushi, or conveyor belt sushi. Many items are low priced and some, like the one we ate at, are 108 yen per plate! And you would be amazed at the variety and quality of sushi you can get for a little over $1 a plate. You can either grab your sushi off the conveyor belt as it goes around the restaurant or you can order from a tablet and the order is delivered, at this restaurant, in a race car on a separate track! There is even a roulette game you can play if you order certain items that might earn you a discount! We made this little video to give you an idea of what a fun and inexpensive meal kaiten sushi can be.